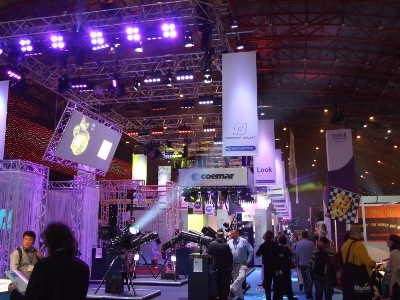 To bring you a PLASA Show round up for 2010, On Stage Lighting braved the crowds and sensory assault that is two exhibition halls stuffed with the brightest and most efficient light sources in show business. If you’ve been reading OSL for more than a year, you’ll know that part of the publishing calendar is our popular report from the UK’s biggest industry get together, the PLASA show. Four days of techie talk, shiny new kit and no doubt a certain amount of alcohol, PLASA is more than just an opportunity for the black t-shirted inhabitants of the underworld to emerge into the light. Apart from the opportunity to collect swag and run into people, PLASA is also at the heart of the industry in this country, where kit makers and users all converge, deals are done and contacts made. Recent developments in my own career, added to the usual motive of getting down and dirty with those that service the entertainment industry, I attended PLASA this year wearing more than one hat. Four days of product demos, seminars and walking miles around Earl’s Court 1 and 2 takes it toll but it does give the OSL readers the inside track on what’s happening in the world of stage lighting. Sorry, Kermit, apparently it’s easier than you seem to suggest so long as you can at least tell everyone how green you are. Wandering among the exhibits, there was definitely a green theme to the show this year. Aside from a number of seminars focussing on the industry and how we can reduce our impact on the environment, it seemed like every other stand had something to tell you about their product’s green credentials. And it is a genuine issue that we need to address, not least because of new carbon emission legislation and targets on the road ahead. With the ever developing LED market, plus other lamp and optical improvements, many exhibitors seemed to want to emphasise their green streak. After last year’s success with an award winning Robin plasma lamped fixture, Robe were showing a range of super efficient moving head fixtures with more conventional discharge lamp technology. Their claim on the green tick was that the new fixtures were similar in brightness to older heads that previously required twice the power consumption, saving not only power but weight, space and materials use. A fashionable spin on the time old “well, this year, we made it brighter” trade show line but there is no doubt that kit makers always find a way to make things chuck more light out. The furious rate that LED technology is evolving, with not only brighter sources and better optical quality but also better colour rendition, it seems like everyone has a green story to tell. 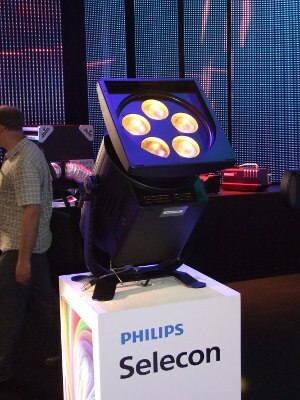 The Phillips family (Selecon, Strand, Varilite et al) were showing non moving light units with light sources using the Varilite VLX engine with decent colour mixing, rendition and beam quality. 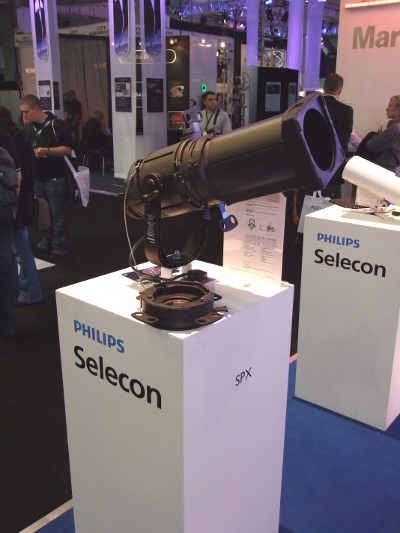 iPix also showed improved LED fixtures, ETC brought their ever expanding Selador range, Wybron had a new LED wash light, everyone wanted to tell you about the latest gen of their coloury splat lighting. Evidence of real LED improvement was everywhere. As usual, there were new/improved lighting fixtures from manufacturers too numerous to mention, but PLASA this year seemed very much about light sources, with a return to the importance of traditional lighting values, such as colour rendition, along with the whizzy techno stuff. Several stands had mannequins dressed in colourful clothing, in order to demonstrate the capabilities of their fixtures, something can be forgotten : we spend a lot of time lighting people on stage, not just produce waggly light pollution and squirting media clips in every direction. 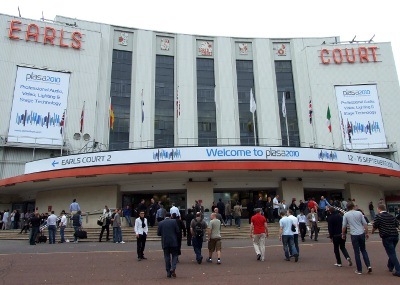 While some years, the industry seems to be producing endless shiny new fixtures or announcing flagship consoles, PLASA 2010 was much more about integrating systems and control progress. A special RDM stand, featuring manufacturers dedicated to that implementation of bi-directional lighting communication, was just one part of a whole show floor full of networked this and integrated that. The Lumen Radio and W-DMX wireless systems took the cable out of control signals, computer based lighting control platforms such as Cuelux and Trace Lighting’s LimeLight had their own take on controlling lighting systems. Several USB – DMX output devices were displayed as well as neat RDM hardware and software from James Embedded Systems Engineering. GDS showed us that it is possible to network almost anything with their new cueing system of prompt desk, nodes and cue light outstations all with centralised control and the ability to program and manage a cue stack of Standbys and Gos. A one-off underwater cue light unit design with standby acknowledgement plunger (for a show using divers) reminded us that GDS are at their best designing solutions to unusual problems. Every media server prided itself in the various systems of integration and compatibility with control surfaces (and improved mapping and image tools) while the pre release Byron build of the Jands Vista software (apparently really nearly ready this year) boasted even better “stage picture” building using it’s single point of contact with both lighting and media with their interface, which could be said to be extremely well suited to shows of the future. Other companies decided to pull together disparate control systems, such as the Midiator surface which aims to provide a single cueing point for a range of other controls such as lighting, media and motion. Cast Lighting offered a software solution to the integration problem with it’s Black Box engine that takes data from a number of other manufacturers controls and in turn instructs different elements to create complex, coherent shows with 3D motion control, lighting, media and IR tracking. In the traditional lighting desk space, probably the biggest shift for any one manufacturer was the roll out of a whole range of touchscreen versions of their most popular consoles after the first glimpse of the Tiger Touch last year – all based on their Titan platform. Even though plenty of older Avo fans have still not quite got over the early versions of their Titan, the stand was crawling with eager button pressers all trying get themselves an Avolife. Apparently the latest Titan releases are much more coherent and stable and I know plenty of LDs who are pleased with the result of Avo looking to find their way over the brick wall that their great classic hardware was creating in the new world. In the last few years, I have found it hard to engage with the Avo stand despite being a regular user of their products. In days gone by, you could quiz Steve or Richard about their latest offerings and get some informed opinion, bounce ideas around while learning more about what they were trying to achieve with their controls. These days, if you can face the bun fight of fan boys and carrier bag hander outters, you might get lucky and get a demo from a teenager who seems to know a whole lot less about lighting programming than you do. This year was no exception and at the first mildy challenging question relating a console to former products (which they had obviously no experience of), the poor guy struggled and I started to lose interest in the fact that you could draw a picture on the touchscreen. I also spoke to a pretty big name in the moving light world who was pretty shocked when he asked during a demo at Avo about RDM and the poor unfortunate could only say “What’s that?”. Anyway, I think that there is something to be said for having demos from people with a lot more experience than two weeks in the warehouse with the latest product. Coolux were showing a great interactive tool for screen media, alongside their very good media server. Called AirTouch, a scanning head recognises gestures in front of a screen for interactive displays. 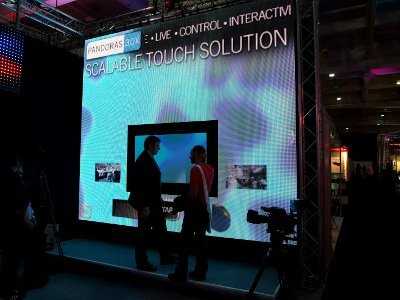 Because the system is based on motion sensing rather than touch screen technology, it has the advantage of being able to scale to pretty much any size and use either projected media, led panels or plasma screen arrays. The stand had an interesting combination of panels with a single plasma screen in the centre. 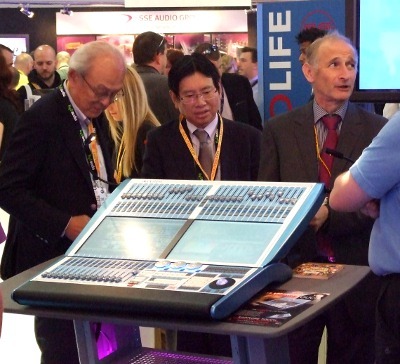 Away from the shiny products, the PLASA show continues to grow as a centre of industry knowledge and education. It’s National Rigging Certifcate training, rigging and AV conferences as well as some great seminars and masterclasses, particularly from InfoComm this year, make attending for all four days even more of a must. This year the new Skills and Qualifications Zone housed a handful of the UK’s most popular theatre production courses and many interested parties from the world of education and employment came together to discuss the future of industry training at a seminar hosted by the National Skills Academy. As the PLASA show continues to evolve in other directions aside from providing a large space to flog shiny toys, it will also continue to become ever more important in our business calendar. 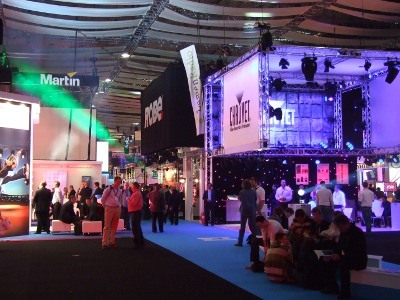 If you looked past the banks of waggly LED washlights and big screens, PLASA 2010 was crawling with little widgets and wires that made shows happen, education and training, industry discourse and deliberation alonside innovation and recognition. Rob, couldn’t make it to PLASA this year (working), so thanks for the update. I agree with your comments about stand demos, in the old days you met with the guys who built or designed the kit, not some shiny sales geek with 2 weeks training. I find the ABBT show a less crowded and friendlier affair, although I haven’t made it there for a year or so. Good Luck with the new hat. This was my first outing to PLASA and I thoroughly enjoyed it, not least because I managed to walk away with a free Avo Titan Mobile!! Hahah I’ve never won anything before so this was a real experience for me! Best things we saw were Robe’s line of moving head projectors (although why they had LED lights stuck around the lens is beyond me), some amazingly huge high-def video screens and Martin’s new tiny Mac 101s which looked EPIC running as blinders-come-videowalls…. Thanks for the report. Really appreciate that you took the time to put a coherent and balanced report together for those of us that couldn’t make it. I only just found this site and I have to say what an interesting read it is. I couldn’t agree more with what you said about AVO, when I first started coming to the show at about the age of 10 I was looking around the AVO stand and I distinctly remember being approached by an AVO rep and being given a full demo of the Azure Shadow and I was pointed at some lights in the roof to play with. I was content, and they had won me over. Unfortunately over the years since the welcome has been less and less friendly and I have lost respect for their company, having been dismissed whilst in a conversation because a “more important” customer approached the stand. But whilst on the subject at PLASA there is the other end of the stick, there is the odd company that I have approached in the past who accept that the young people going around now are the users of the future (I’m not talking about the free-be grabbers, although the odd sweet is always nice!!) 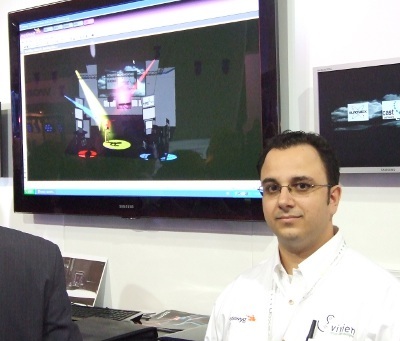 and over the years I have had many good long conversations with the likes of Wireless Solution, various Laser companies, Look Solutions and I have even been contributing to the development of a PC based lighting controller (Sweetlight – also known as ShowXpress) which was a relationship that started at PLASA many years ago. Funnily enough it has turned out that the sides have now changed and for the first time this year I was demoing for an audio company so it was me on the receiving end of the interesting 10 year old, it was a pleasure to see the look of awe as I told them about the shiny equipment. I just thought that my story of PLASA might be of interest to someone who has been shunned by a company – the nice ones are out there, its a matter of finding them. Hi Tom, interesting to hear your experience on the Avo stand. On one hand, it seems that you feel you didn’t get a look in when “less important” as a customer, where I seen some pretty big fish in the lighting world not be able to get near the gear for carrier bag toting kids with lanyards. Of course, it’s possible to get demos privately etc. but it amused me that one of the biggest names in moving light control from the US found getting information too much like hard work.